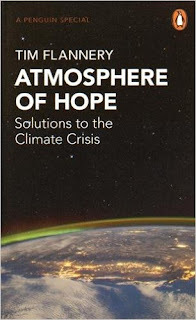 With the Paris summit on climate change just concluded, it's hard to imagine a better time for a new book on the subject, and the subtitle of Tim Flannery's chunky little volume is very encouraging: 'solutions to the climate crisis.' In fact it is just as well he is offering solutions. Not only are the shelves pretty full of titles telling how terrible the impact of climate change is going to be, but (misery memoirs apart) there is quite a strong feeling that doom and gloom books don't sell. It's not that Flannery begins in cheerful mood. He takes us through the increasingly indisputable evidence that climate change is not just happening but is already having impact on everyday lives, from bush fires in Australia to flooding in the UK. After presenting a picture of increasingly disastrous implications if we choose to carry on as normal, Flannery takes us through the various key means of producing energy, their impact on the climate and where we need to be concentrating. It's fascinating that after concerns in the past about running out of fossil fuels, Flannery thinks that before long we will be moving away from them with plenty left, as the money is divested from the industry. When it comes to what replaces fossil fuels, he is hugely enthusiastic about wind and solar and brushes aside concerns about their limited availability (e.g. solar at night or in a UK winter) without giving a clear picture of how the balance will be maintained. He is also dismissive of nuclear, in an argument that seems more emotional than logical. One of the most interesting aspects of this section is his admission that in his previous bestselling book, published 10 years ago, he pretty much ignored electric cars, assuming that hydrogen etc. would be the preferred solution, but now he is (sensibly) wholeheartedly behind them. We then move onto solutions. Flannery is rightly suspicious of the kind of geoengineering that fights fire with fire, for instance seeding the stratosphere with sulfur to mimic the cooling effect of a massive volcanic eruption. But he is very positive about various techniques to take carbon out of the atmosphere (though oddly dismissive of the low hanging fruit contributed of taking carbon dioxide from power station exhausts). He also claims that where once all we could do as individuals was wait for the politicians or dabble with low energy lightbulbs, now we can do much more. However, apart from fitting solar panels (not an option for many of us), this 'action' seems to be limited to joining activist groups, which may be more likely to generate hot air than reduce carbon emissions. 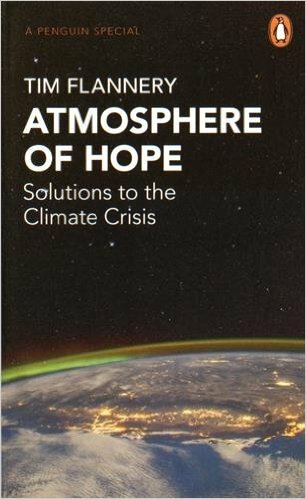 However, my niggles don't prevent this being an important and thoughtful book, giving up-to-the-minute analysis of our climate situation and what can be done about it. I hope Nigella will be buying a copy for her dad.